What is Sand Tray Play Therapy? As the name suggests, Sand Tray Therapy consists of playing in a specifically proportioned tray filled with sand. Immersed in play, the client loosens his or her hold on known life narratives and can explore feeling states and experiences, which may be outside of daily conscious awareness. Internal material becomes manifest in the external world, and thus becomes available for processing and change. The physical experiences that unfold in the sand tray can access neural pathways of these wordless memories. As these troubling memories are played with, old neural pathways take in the safety of the therapeutic environment and the compassion of the therapist. This new information flow in the brain offers an opportunity to heal troubling relational patterns (Grayson, R., 2015). This approach can be appropriate for people at any age and has been a form of therapy used since the 1940’s. Sand tray therapy can be used with children, adolescents, adults and families. An excellent use for the sand tray is with but not limited to grief, trauma, depression, anxiety, social skills, difficulty adjusting to life changes and many other challenges when words are difficult to utter or fully process. When clients touch the sand, it can be very soothing to the psyche, offering a healing beyond what we can visibly understand. The design of the sand tray environment is a safe, contained world that is controlled by the client, and can be manipulated or changed by adding, subtracting, or moving miniatures within the sand tray. It does not require any artistic skill to have a satisfying sand tray experience—only selecting and placing objects. 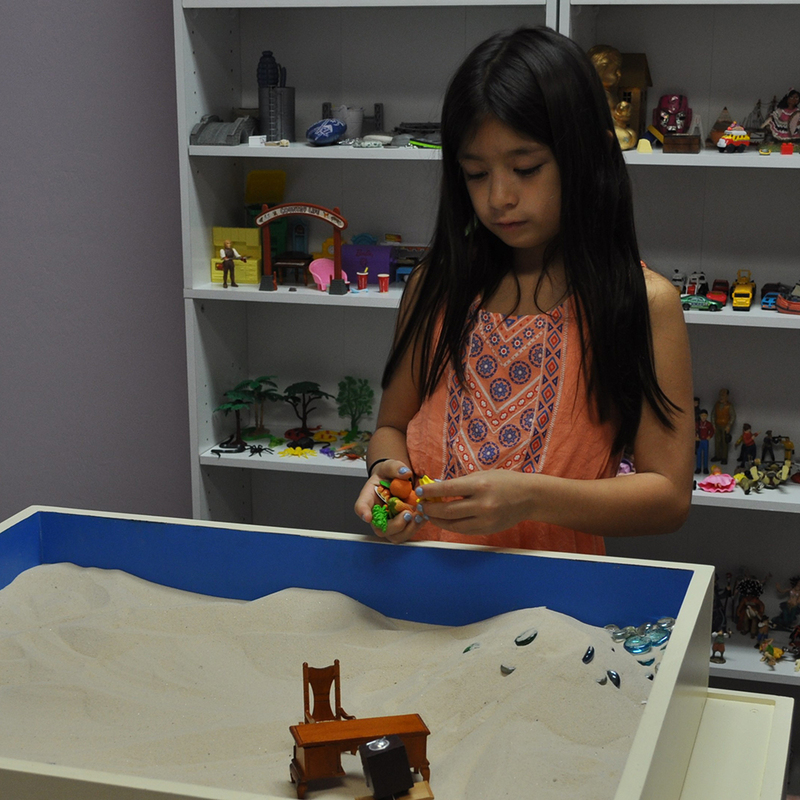 Physically moving representational objects within the sand tray container has a beneficial effect on the body, especially in people who have undergone traumatic experiences—more so than simply talking about memories or ideas.